Competency-based education (CBE) is taking off. It's estimated that 600 post-secondary institutions have a CBE program in the implementation stage or already underway. That's ten-times the number found just two years ago. With all this interest, we polled recent webinar attendees to find out where they are on their journey to CBE, and to see what challenges and level of effort they're experiencing as they make their way into this exciting new world. 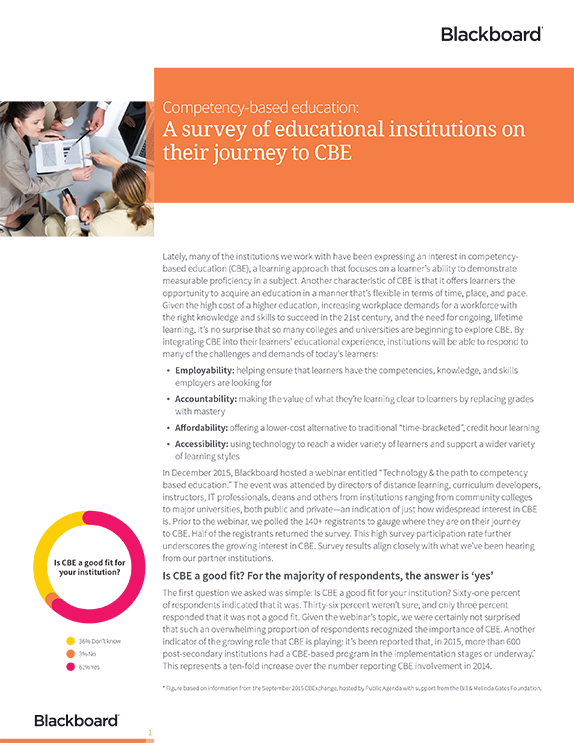 Download this brief today to see how your CBE expectations and experiences compare. ©2016 Blackboard Inc. All Rights Reserved.